GENEROUS Bognor Regis allotment holder Derek Baker has become the town’s first Angel of the South. 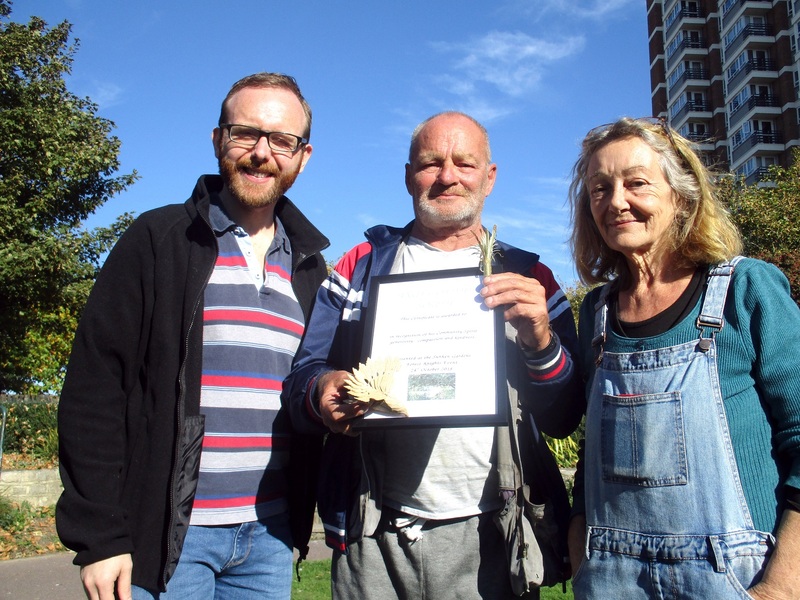 Derek was presented with the new honour by the Bognor Community Gardeners in recognition of the free food he provides for a host of residents. Derek cultivates two allotments in Hook Lane and gives away much of the produce he grows. Carrots, peas, cauliflowers, leeks and brussel sprouts are among the healthy vegetables he provides to ensure those who struggle to pay for food can eat some nutritious food. Derek, 64, said: “It’s a bit of a shock and embarrassing to get this award. It’s nice to be recognised for what I am doing. “But I don’t do it for recognition. I do it for the pleasure of helping people who can’t afford proper food. It is nice to give people something decent to eat. “It’s very satisfying growing vegetables from the start. Planting the seed and watching it grow and is a good feeling. This year’s scorching summer even enabled Derek, 64, to grow melons in the three greenhouses he has on his plots. “I go down there every day for a couple of hours. It gives me something to do,” said the former mental health services worker. He distributes some of the food to people he knows need it. He takes other bagfuls are taken to Granddads Front Room Community Interest Company in the High Street for it to pass on. His certificate was awarded by the community gardeners’ founder, Kim Davis, and their treasurer, Matt Stanley. The presentation took place at the first community day held by gardeners at the Sunken Garden in Bognor Regis town centre where they do most of their work. Last week’s popular event, inset right, saw them host the Forest Knights in the garden, located between the Hothamton car park and Waterloo Square. The free activities included toasting marshmallows, basic bushcraft, rope making, wood whittling and lavender bag making. Matt said: “The day has gone really well. We had 10 people waiting before we started and there have been about 70-80 people here in the first hour. “The weather has helped and it has brought the community into the garden, which is what we want. “The more people who come here the better and events like this showcase the wonderful work the gardeners do. Among the families who went along were Jenny Foster and her two children, Marnie Foster, five, and Linden Foster, two, and their friend, Poppy Field, five. Jenny said: “This is a lovely event. It’s nice to have something to come to with the children which is free. “It is also good to get the children outside doing something which is interesting to them. The community gardeners hope to stage a series of activities. The next will be a visit from Owls About Town on November 24.